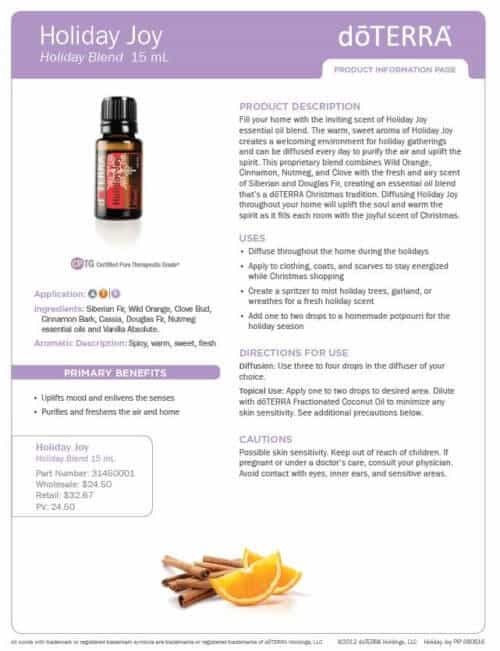 doTERRA Holiday Joy Blend Fills your home with the inviting scent of Holiday Joy. This proprietary blend combines Wild Orange, Cinnamon, Nutmeg, and Clove with the fresh and airy scent of Siberian and Douglas Fir, creating an essential oil blend that’s a doTERRA Christmas tradition. Diffusing Holiday Joy throughout your home will uplift the soul and warm the spirit as it fills each room with the joyful scent of Christmas.